AccuWeather adds precision to ..
Spring 2012 Honors Lecture Ser.. Hundreds of supportive teachers and parents from across middle Tennessee gathered in MTSU’s Murphy Center Feb. 23 to support an impressive group of bright and dedicated young inventors. Melissa Poarch, right, gives her daughter, McFadden Elementary fifth-grader Julia Poarch, and her partner, Aislyn Welch, left, last-minute pointers on their presentation for their invention “Dog Gone Doggie Door Opener” during the 2012 Invention Convention at MTSU’s Murphy Center Feb. 20. “I’m so proud of you. You are an inventor. You’ve taken the time to think and create, problem-solve and literally create something that wasn’t here before you made it,” Dr. Tracey Huddleston, founder of MTSU’s Invention Convention and a professor of elementary and special education at the University, said in welcoming the youngsters. Each participating inventor left the convention a winner with a certificate of participation and a gift of this year’s selected “feature invention,” tubes of ChapStick lip balm, invented in the early 1880s by a Virginia physician. Alexander Hagerman, left, and Ben Brashear, fifth-graders at Castle Heights Elementary School in Lebanon, Tenn., play their game, “Conquer the Fort,” during the 2012 Invention Convention in Murphy Center. the Judges’ Favorite Award, a ribbon presented to the student or students who, in addition to meeting all requirements, provide a memorable and unique invention. 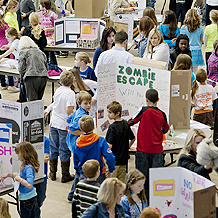 For more information on the Invention Convention, including the contest rules, visit www.mtsu.edu/elementary/invention_convention.shtml or contact Huddleston at Tracey.Huddleston@mtsu.edu. You also can watch a video about the 2012 event below.